Iceland's biggest volcano has been on the verge of erupting for a good few years now, but over the past few days, four earthquakes have been detected in the surrounding area. While this Earth shimmying might seem concerning, they are more indicative of what is happening beneath the ground, and won't themselves cause the volcano to erupt. For now, there isn't any cause for immediate concern. The experts monitoring the mountain, which is the second-highest peak in Iceland and last erupted in 2014, still predict that it could be up to another few years before the volcano spews its magma over the Nordic nation. Some are concerned that if and when this happens, there could be a repeat of the infamous 2010 Icelandic eruption. 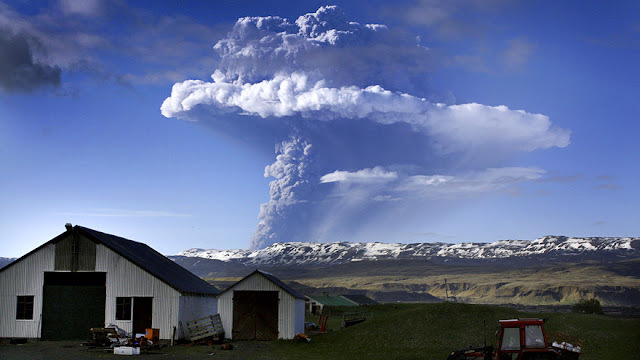 The ash cloud produced by the wonderfully named Eyjafjallajokull, which is estimated to have been around 250 million cubic meters (8.8 billion cubic feet), wreaked havoc across much of Europe. For five days, much of the airspace was shut down, as there were concerns that the ash could seriously damage the engines of any planes caught flying through it. This created what is thought to have been the largest disruption of air travel since World War II. Earthquakes around active volcanoes are a common occurrence. As the magma below the surface migrates into the chamber of the volcano, the movement of such massive amounts of molten rock inevitably causes the ground to wobble a bit. From this perspective then, the earthquakes are not the cause of the eruption but instead seen as a symptom of the impending blast that could occur at any point within years. When it comes to Iceland, there are always going to report that an eruption is imminent. This is because Iceland is straddling the fault line between the American and Eurasian plates, thus making it a particular hotspot. It will always have volcanoes, as magma snakes its way through the fissure and eventually bursts through the surface, but few actually do as much damage as Eyjafjallajokull. If the volcano happens to be sitting under a glacier, then the chances are heightened, but even so, one study has already suggested that such an event is unlikely to happen for a few decades.